A bit unusual, but hey, it’s Nintendo! They did not mention any new Kirby game on the show floor, but it’s sure as hell official – Kirby Wii is coming, and it’s not a gimmick like Epic Yarn. 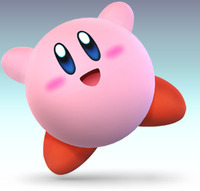 Based on what has been seen it is a true Kirby game with sucking, spitting and burning. Trailer coming in the near future, for now, enjoy the screens.